Pre-heat oven to 175°C / 350°F, use centre rack. Fill kettle and turn on low now. Grease springform pan and line bottom with parchment paper. Line outside of pan with heavy tinfoil (required for bain marie). Mix the cookie crumbs with melted butter. Press crumbs firmly into bottom of pan to form crust, bake in oven for 10 minutes and remove from now. LOWER OVEN TO 150°C / 300°F. Gently beat cream cheese for 2-3 Min on Low. Beat in sugar until combined. Beat in the eggs (one at time) until combined. Beat in the vanilla, now set aside. Chop chocolate with a serrated blade. 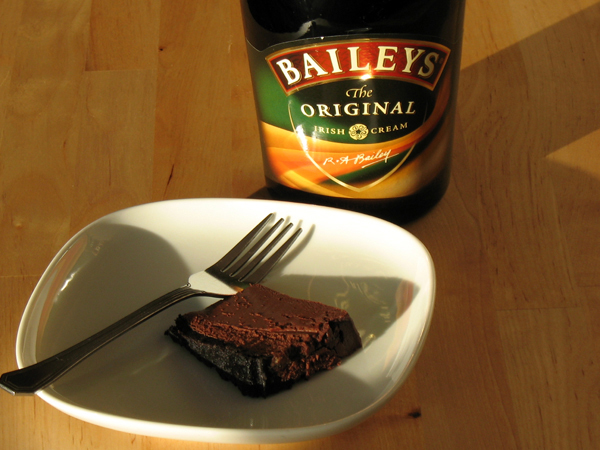 Melt chocolate, then stir in Baileys. Stir chocolate into cream cheese mixture. Place spring-form pan into bain marie. Bake 50-60 minutes at 150°C / 300°F. When cake is done, edges are set but centre will jiggle. Remove from oven but do not open spring-form pan. Use frosting spatula to loosen the pan away from the cake. Cover and refrigerate overnight, or at least for 8 hours. Remove tinfoil, carefully open the latch on the pan, lift it away from the cake. Cut cake using hot knife method. Let pieces stand 20 min before serving.